The euro is at a three-month low. The FTSE closed down 1.8%, the lowest level this year. The MSCI world equity index shows a 0.4% fall. All in all, it's a grim day for global finance. If there’s one thing that the markets don’t like, it’s surprises. And while the election of new President François Hollande in France, the political turmoil and realistic prospect default in Greece, and the Spanish banking crisis are not in themselves surprises, the consequences are unpredictable. Investors, therefore, are running for the hills. The hills being those safe haven German bonds that everyone loves in times of trouble. The price of German government bonds hit record highs last night as Greece’s new coalition party continued to attack 'barbarous' austerity cuts. But this isn’t quite a panic buy, not yet. Greece still hasn’t defaulted and bunds are too pricey to keep stockpiling blindly. But Germany plans to sell up to €5bn-worth of five-year bonds today, so we’ll have to wait and see how that goes. The single currency is not having a good week. It fell 0.3% last night to $1.2977, just a whisker away from the three-month low of $1.2955 reached on Monday. Global shares, measured by the MSCI world equity index, have fallen 0.4% t to 316.40 points, also close to its 2012 low. Across the board, the markets look bleak: Stocks on the Ibex 35 index fell 2.2% as fears spread that Spain was following Greece down the drain. Japan's Nikkei 225 index is down 1.5%, South Korea's Kospi lost 0.8% and Australia's ASX 200 dipped 0.9%. Even the US Dow Jones is down 0.59%: no one is immune from the eurozone turmoil. 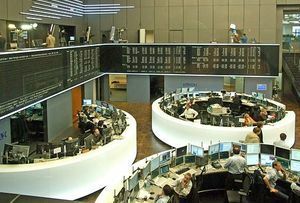 Plus, crude oil is heading for its sixth session of losses today, settling at $96.40 a barrel, as it tracks tumbling prices for other commodities amid global fears over the eurozone’s political future and economic recovery.